"Seven-Seventy" is the way Chabad Chassidim refer to the building at 770 Eastern Parkway, one of the main avenues in Brooklyn. A wealthy New York physician built the house in the 1930's. It is sturdy, well designed, and made of top-grade, special-order materials, as if the physi­cian had known the crucial role his house would play in the future. The handsome, unostentatious house is made of red brick, with a pointed roof executed in the Gothic style. The heavy oak doors with brass handles highlight the house's design. In front of the house are several trees and carefully trimmed bushes. The previous Rebbe bought the house im­mediately upon his arrival in New York. At that time, the Crown Heights neighborhood where the house is situated was one of the most prosperous Jewish areas in New York. "In America everything is different," said the Jews who came to the "land of unlimited opportunities." The spiritual heritage carried by these Jews and their ancestors through centuries of pogroms and hardships began to lose its significance in their eyes. Rebbe Yosef Yitzchak burst onto the carefree world of American Jewry like a merciless pang of conscience, like an accuser and a prophet. His goal was to convince everybody that adherence to the Jewish lifestyle must not be different in America from Eastern Europe in the old days. Since the first day that "Seven-Seventy" became the world headquarters of Chabad-Lubavitch, the building has been the launching pad for a tireless campaign aimed at pre­venting assimilation and ensuring that Jews remain Jews. The second floor houses the apartment of the previous Rebbe. Above that is the apartment of Rebbe Yosef Yitz­chak's other son-in-law, the late Rabbi Shmaryahu Gur­Aryeh, a former head of the Central Lubavitch Yeshiva. 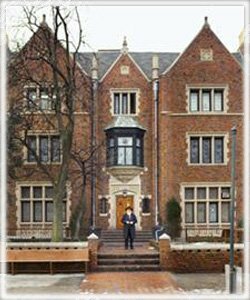 The rest of the house contains the various institutions of the Chabad headquarters. The Rebbe's office is a small, mod­estly furnished room. There, the Rebbe spent fifteen to twenty hours a day, writing, studying holy books, reading and replying to letters and telegrams. From there he led the worldwide struggle against assimilation, and issued instruc­tions to his emissaries dispatched to the four comers of the earth, who work indefatigably to found new schools and centers of Jewish education. This entire enterprise is part of a wonderful process, set in motion by the Rebbe, of hasten­ing the Age of Mashiach and heralding the Redemption ­G*d's ultimate purpose in creating the universe and human­ity. The reception room also occupies a space of no more than eighteen square yards. The entire room is cluttered with piles of papers, newspaper clippings, brochures, books and countless letters. In the center of the room are two desks containing typewriters and several antediluvian telephones ­and that is all. The telephones deserve special mention. If there were a global competition for the greatest number of incoming calls, these telephones would definitely take first prize: they ring non-stop from morning to midnight, except for Satur­days and holidays, of course. An endless stream of visitors navigates the small area that is free of mailbags, desks and piles of paper. Working in the midst of all this commotion are the secretaries - Rab­bis Leibl Groner and Binyamin Klein. They are usually poised with one hand clutching a stack of letters, the other holding a pen, with a telephone receiver wedged between shoulder and cheek; or, in another version, the right hand on the typewriter, while the left hand sorts through a huge stack of letters addressed to the Rebbe. Their ears are invariably glued to a telephone receiver - sometimes two at a time. They spend only a few hours a week with their families - on Shabbat, when even the Rebbe goes home. The secretaries' entire lives revolve around the Rebbe's schedule. They work for years without a single va­cation, not even for a day or a mere hour to take care of their private matters. Day and night, including Saturdays and holidays they are on duty (obviously, without telephones, pens or typewriters on Saturdays and holidays). Naturally, this kind of unflagging effort required infinite self-sacrifice on the part of their wives and children as well. It is told that once Rabbi Binyamin Klein's young daughter came into the reception room and quietly stood in the comer. When one of the visitors asked her what she was doing there, she replied, "Nothing. I just came to look at Daddy." Nestled on the ground floor is a tiny room no larger than an average-size closet; this was the office of Rabbi Chaim Mordechai Isaac Hodakov, the Rebbe's personal sec­retary and head of the Center for Jewish Education. He was in charge of the entire global network of Chabad-Lubavitch emissaries. Adjacent to this room is the broadcasting center; from here radio, and occasionally television broadcasts of far­brengens are transmitted to the entire world. The same floor houses the small synagogue, where the Rebbe prays on weekdays. A few steps lead down to the large synagogue, which has been expanded by incorporating adjoining houses into the structure. This synagogue has more congregants than any other synagogue in the world. On holidays, the congregation can number five thousand or more. Other synagogues may be more spacious, or have comfortable benches or even individual chairs. Here seats are available only to the most elderly and respected com­munity members, and even they have to crowd onto narrow, plain, rough bleachers that look like they were imported from some small town in the Russian Pale of Settlement. The majority of worshippers have to stand, forming a close packed human mass. The large synagogue is used for prayers, Talmud les­sons, farbrengens, children's meetings, and women's con­ferences. On weekdays, it is occupied by several dozen minyanim, with two, three, or even five minyanim, each made up of twenty to thirty people, praying simultaneously in dif­ferent sections of the huge hall. From six a.m. to midday, one can join the morning prayer. One can also join one of the groups gathered in the comers of the hall, and hear a lesson on the Talmud, the Mishna, the Shulchan Aruch, and of course Chassidism, conducted separately for different skill levels. The language of instruction is also a matter of choice: the lessons are held in Hebrew, Yiddish, English, French, Spanish, Portuguese and Russian. People are in the synagogue at all times, day and night - praying, learning, talking, arguing, eating, and even sleeping. Annexed to the original "Seven-Seventy" are several buildings housing a yeshiva, a kollel, a publishing house, and nearby a school and a teachers' college for women. These buildings are also used by organizations affiliated with Chabad. The complex also contains a library and an ar­chive of rare manuscripts, where research is conducted and manuscripts are prepared for printing. Here, hundreds of books on Judaism, as well as newspapers, brochures and en­cyclopedias are written, edited and published. Here too is an educational center for ba'alei teshuvah. An outsider who comes here for the first time may be uncomfortable and disoriented by the apparent chaotic tur­moil and disorderly mingling of the crowd. However, as soon as the Rebbe emerges from his study an incredible thing happens: the crowd, packed beyond all limits, in­stantly parts as if by magic, leaving a wide passage for the Rebbe. As soon as he passes, the crowd closes once again. Here one can meet disgruntled people, complaining about every trivial matter - this one has been pushed aside, that one has been deprived of proper attention and respect. Some are disappointed because the Rebbe was unable to re­ceive them. They know perfectly well that for many years now the Rebbe has not granted private audiences, but every case is so important, every problem is so complicated, they think that perhaps the Rebbe could make an exception just this once ... That is what they think. To get a sense of the atmosphere that pervades this place, to see beyond the outer disorder and confusion to its inner rhythm and purpose, one has to grow accustomed to it. With time, you are infected by the general mood, everything trivial falls away, and you are suffused with the sublime beauty and joy that fill this place. Our holy books say that the Jerusalem Temple radi­ated a glow that suffused the entire world. The same can be said about "Seven-Seventy": the light of Judaism that it casts illuminates the entire world. From here, emissaries disperse around the globe to wage a tireless, uncompromis­ing battle against assimilation, a battle to return Jews to the Torah, a battle to hasten the arrival of Mashiach and the Re­demption. In fact, each of the Rebbe's Chassidim considers himself an emissary. What gives them strength for this relentless battle? What is the source that nourishes the exalted ideals of these emissaries? "Seven-Seventy," which Chabad Chassidim also call Beit Chayeinu (Hebrew for the "House of Our Lives"), is this source. Every minute spent in this house is a festive occasion. Every visit to "Seven-Seventy" is a springboard to a spiritual flight that may last months or even years. Many Chassidim compare their visits to "Seven ­Seventy" to the process of recharging electric batteries.